Fibonacci card games are games of chance and skill for up to four players using a special deck of cards. They are "draw and discard" rummy style games. The objective is to form the cards in one's hand into sets putting them face up on the table in "melds", to be the first player to complete six sets and then to "go out" with no cards left over. Players score by completing melds and by going out. The game can also be played Solitaire. Several different games can be played with the one card deck. There are 89 cards in Fibonacci Deck 21© and, except for three wild cards and two bonus cards, each card is identified with one of six numbers in the Fibonacci series, specifically: 2, 3, 5, 8, 13 and 21 as shown in the picture to the left. The numbers in a completed set of cards have to add to 21. A set can be simply one card, (card 21) or as many as eight cards for example: 2, 2, 2, 3, 3, 3, 3 and 3. A unique feature of the Fibonacci series is that each number is equal to the sum of the two preceding lower numbers. For example 5 = 3 + 2, and 21 = 13 + 8. It is this feature, in combination with the rules, that makes the Fibonacci rummy game challenging and unique. Certain cards in the deck are designated as "base cards". Each set must start with a base card except for the single card set 21. The number on the top left corner of a base card is red and two rabbits can be seen on top of the colored area. A bonus card for base 2 (see the bottom right corner card opposite) includes two number 3's making this card total 8. Each card has graphics associated with the card number. The heights of the colored rectangles and the colored areas on each card are proportional to the Fibonacci number. The number 21 card is colored 100% from top to bottom and is 3.5 inches high. The number of petals on the flower in the center of the card is equal to the Fibonacci number. The colored areas on card combinations that add to 21 would exactly fill a single card. Cards can be stacked and overlapped on top of each other, the bottom of one card to top of the colored area on another card, as a visual aid to set collection. The card on the left is a wild card, the Fibonacci card. 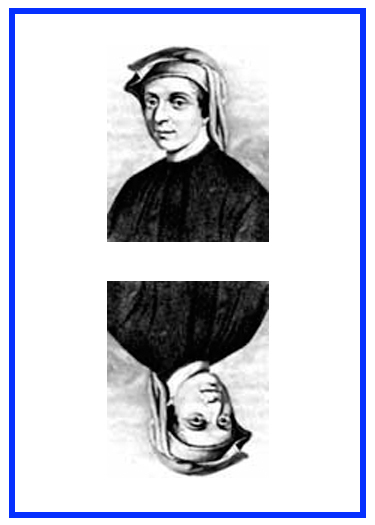 The picture is of Leonardo Pisano Fibonacci, the 13th century mathematician. Fibonacci showed that the number series answers a question as to how a rabbit population grows. See "About Fibonacci". The Fibonacci card can be used as a base card or in a set. 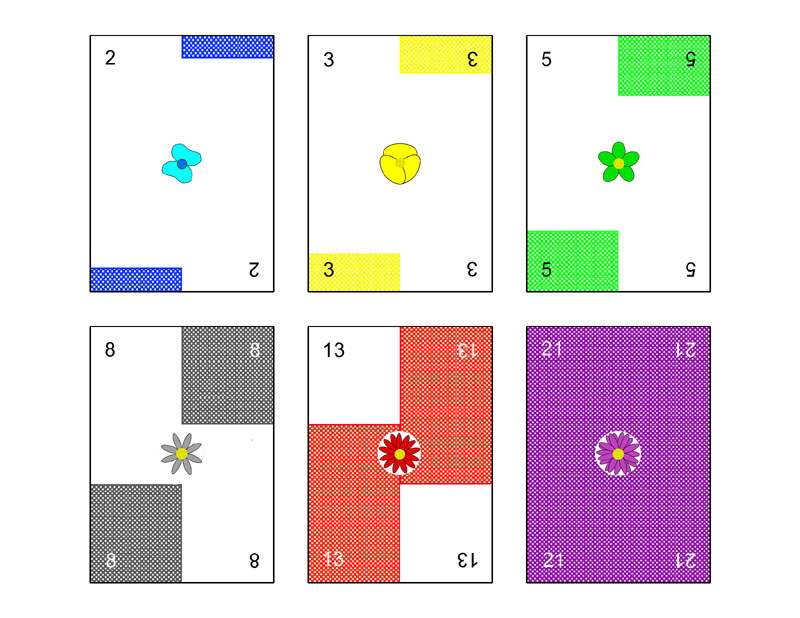 The player has to designate the number which the card represents but can change the designation as the game progresses. 4 base cards each of 2, 3, 5, 8, 13 and 4 of card 21. There are 13 different type of cards. Deck 21© is used to play the game Fibonacci 21© and Canasta 21© . Cards are removed to play Fibonacci 13© and Fibonacci 8©.